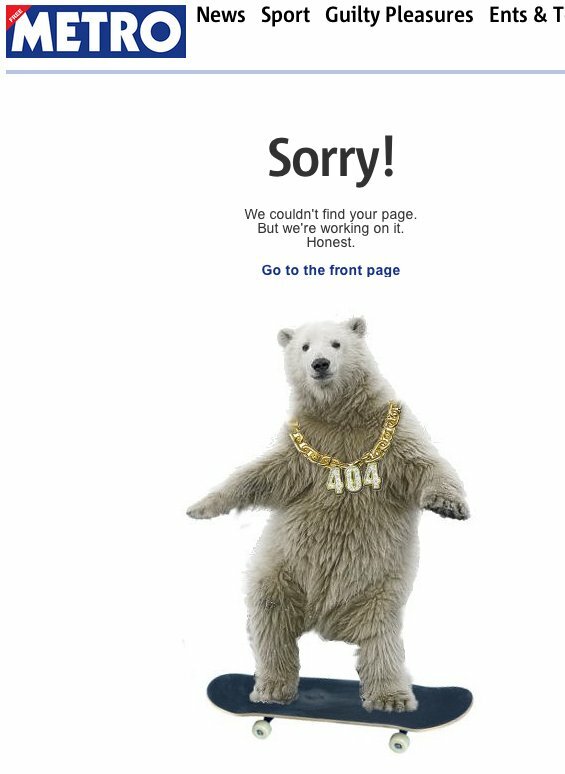 Over the past few years error pages of the Internet have got a lot more interesting. Page Not Found know as HTTP 404 has been at the front of this movement. Rather than the more staid errors of old developers have started to inject their own special kind of humour into them. I was really interested In the psychology behind these pages, I then read “Your Logo Is Making Me Sick” which explains that when people are angry with your brand the last thing you want to do is have your logo part of that negative experience. Every product will at some point encounter a critical error and/or force the user to wait. Don’t let those moments become synonymous with your brand. The other thing to note is the state of the project that this was developed at. We were aiming for a very aggressive MVP release date and the whole team were really pushing hard for this. We knew we wouldn’t get it all right straight away with over 300k articles to migrate from multiple previous CMS’s and a completely new responsive front end. I had spent the day browsing 33 Animals Who Are Extremely Disappointed In You to prepare myself for possible miss of the release date as the project was on a knife edge. Then it struck me for all those people that wouldn’t quite make it to where they wanted why not give them something funny to look at to leave them with a slightly confused but happy feeling. Image rights can be a bit of a nightmare but Metro has some great content and having had a chat with the content team the dancing polar bear was selected. The Sunday before the project as due to go live the team were in the office in a slightly silly mood and I happened to skate in that day to blow a few cobwebs out. GIMP came out and the dancing polar bear was born. He was later pimped out with a 404 chain just to complete the effect. I distinctly remember one of my team going surely this can’t be the most important thing we have to work on right now. However when you have been banging your head against big problems for a week a break and something to take your mind off what you are doing is exactly what is needed. The day we went live we were monitoring 404 errors and suddenly saw our 404 page shoot to the top of our most read pages. We realised that it was being done on purpose to share on Twitter and from then on a legend was born. To get #1 on Buzzfeed’s “The 28 Best Error Pages On The Internet” was just the icing on the cake. Thanks to @stephanfowler for the GIMP skills. LINDSTRØM & TODD TERJE – Lanzarote is such a banging tune it just keeps on building and the slightly silly vocal makes me laugh a little like our polar bear friend.